Die Werkpiloten are Christian Aufderstroth alias Krischi (Vocals) and Stefan Caesar alias Prinz Eisenhart (Programming). 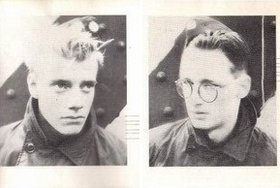 The duo was active from 1981 till 1986, published 4 cassettes including a compilation on their label “Werkpilot Industrial Releases” and after that a gladly heard guest on various Tape-Compilations of the 80's Cassette-Culture. It’s music that, except guitar and bass, mainly has electric origins, that flows, sways and encourages to dream. It should kidnap the listener out of his everyday life in another, wonderful world. Music for films that is played while driving around with the car or daydreams. Constantly changing between introverted soundtracks and elaborated electro tracks. A complex and multifarious “Industrial Pop”, inspired of a emotional-melancholic attitude whose inspiration has its origins in Manchester an the factory-label of Section 25 and Joy Division. That is not surprising if you know were those two test pilots grew up. They come from the Ruhrgebiet, characterized by coal industry, working-class environment, tristesse and illusions that were bounded to there area of life. Creating something under one’s own steam, letting phantasy get reality and comparing this with others was the Werkpilot’s desire. Pictures - are a reflected image now, Music - probably the last human beat, Performed - by some confused hearts.